My introduction to the work of Hardijs Lediņš came via a recommendation from a friend excitedly telling me about the year of events in 2015 that would commemorate 60 years since his birth. Intrigued by the description she gave of his music, and the fact that much of his work was available for free online, I started to investigate. I was met with a dense, diverse catalogue ranging from absurdist sound experiments to wonky electronic pop music. That eccentric take on pop, which perhaps echoes post-punk and new wave music from further ‘west’, but is in reality completely unique and impossible to place into genre brackets, got me hooked on Lediņš. In the year that the Latvian Centre for Contemporary Art went to great lengths to pay tribute to his work, however, the thing that really stood out was just how much more there was than music to this singular artist’s oeuvre. Lediņš, and his band NSRD (Nebijušu Sajūtu Restaurēšanas Darbnīca: Workshop for the Restoration of Unfelt Sensations) were an important landmark in Latvian culture, as an act of rebellion, a challenge to traditional artistic forms, and as breakers of the barriers between the populist and the academic. Lediņš acted as a conduit, bringing experimental ideas into Latvia through his writing, his DJing and the events he organised. Just as importantly however, he absorbed the ideology behind these art forms and made his own, unique contributions. Although rarely spoken about outside of Latvia, Lediņš will resonate with fans of anything from musique concrète to psychedelia, krautrock to art-punk. A trained architect, Lediņš first appeared on the Latvian art scene in the late 1970s. Prior to forming NSRD with his long time collaborator, Juris Bolko, Lediņš had been an organiser and critic. He DJed at events in Riga’s Anglican church, arranged concerts for minimalist composers in the city, and wrote articles and essays dissecting post-modernism. In 1982 Lediņš and Boriko formed NSRD, nominally a band, but one with a revolving line-up of contributors, and a revolving approach to multimedia performance. This diversity and ambition becomes even more remarkable when you consider the context from which it came. Born in 1955, Lediņš was raised in the Soviet Union. At a time when artistic expression was closely controlled, individuality smothered, and Latvia’s identity itself at risk, he created something distinctly Latvian without resorting to folk-tinged nostalgia. Latvia is often called a country of singers. One of the main streets in the capital Riga is named after a famed compiler of folk songs; every six years there is a national holiday for a song and dance festival. Latvia’s cultural history is clearly strong. Lediņš was one of a group of artists that showed it also had a future. His work undoubtedly exudes something specific to Latvia, a clash between electronic composition and pastoral tones, between the modern and the traditional. It’s the same contrast anyone will feel if they venture beyond Riga’s city centre to the districts of Imanta, Bolderāja or Mežciems, where slabs of Soviet architecture rub against miles of untouched countryside. You don’t have to be Latvian though, to appreciate the art of Hardijs Lediņš and his collaborators. His work fits chronologically, ideologically and stylistically alongside a host of artistic trends occuring across the world at the time, whether it be outsider pop music, DIY punk ideals, post-modern art installations or electronic experimentation. The life blood of such styles is the need to constantly evolve, to make something new through amalgamation or innovation that is distinct to what is happening elsewhere. The most fascinating achievement of Lediņš was to capture these ideologies without aping the exact forms, creating something truly distinct both locally and internationally. NSRD were a band which was just as likely to play in a theatre as they were in an apartment, the choices of venue mimicking the scope of the band’s music. On the one hand Lediņš created modern compositions which experimented with form in a way reminiscent of Stockhausen, or the aleatory compositions of John Cage. Alongside these lofty ideas, however, he remained rooted in populism. Early last year a concert at the Anglican Church by his former bandmates brought home that despite all the experimentation and absurdism, Lediņš also crafted a playful, beautifully melodic psychedelic pop. Annual excursions to Bolderāja revealed his skill at balancing the conceptual with the communal. It also stressed his desire to create art beyond the confines of the theatre or the gallery. Starting in 1980, Lediņš and Boiko went on an annual hike from their homes in central Riga to the port district of Bolderāja. Each time the event was documented, initially with images, but eventually with video and music. Each year the hike would happen in a different month, and each year more artists would join in. There are two clear points of reference for Hardijs Lediņš, which help place him into a broader context while at the same time highlighting his individuality. The first is the Krautrock movement of late 60s, early 70s Germany, epitomised by the likes of Neu!, Can, Faust and most famously, Kraftwerk. This was a movement where youthful rebellion was amplified by the instability of post war-Germany. Artists either broke down traditional song structures or used unusual instrumentation in an aggressive attempt to stand against the reactionary traditions present in rock music. The second is the post-punk and art-rock scenes of Western Europe and the USA in the late 1970s and 1980s. Bands such as the Raincoats, the Fall, Joy Division, Sonic Youth and Kleenex applied post-modern and situationist concepts to the creation of music, foregoing musical ability for innovation while staying rooted in popular culture. Although stylistically far removed from both of these movements, Lediņš’s work undoubtedly embodied their approaches and beliefs, questioning given forms and striving desperately to formulate something new while avoiding being elitist. Rampantly absorbing a myriad of ideas and refracting them through his own, unique prism. The final years of Lediņš’s life were blighted by poor health and depression, yet he remained an active presence on the Latvian art scene. Even now, among young artists and musicians in Riga his influence can be felt. The hikes to Bolderāja continued up until 2002, and a generation of contemporary artists were either directly or indirectly influenced by them. For others, they witnessed DJ sets by Lediņš around the city’s venues (he remained an active DJ up until his death). Speaking to musicians working in Latvia now who witnessed those DJ sets, the thing that always stands out is that he consistently indulged music other Latvian DJs didn’t. Not deliberately contrarian, he was simply always looking for something new – for example, playing reggae and electronic music, at a time when these styles were rarely heard in Latvia. 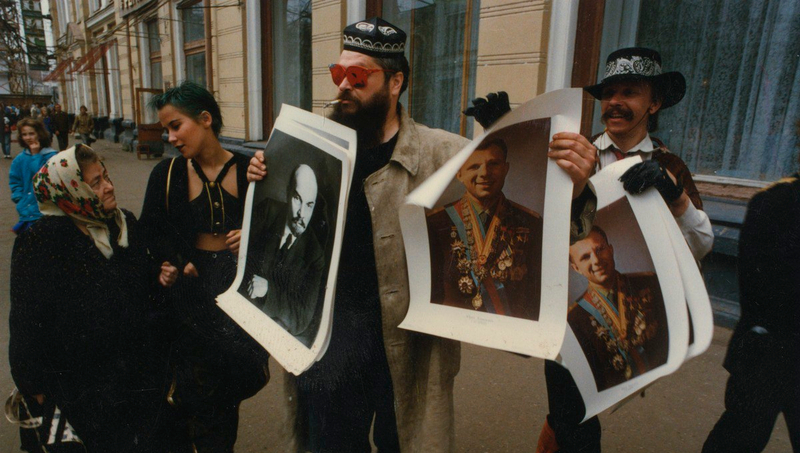 He remained a visible, eccentric figure around Riga right up to his death, although his last years were difficult due to a combination of mental illness and the lack of recognition his work had received. At one point he resorted to traveling around offices in the city, attempting to sell copies of his CDs. Unemployed and living with his mother, Lediņš only had Latvian state disability benefit to survive on. It’s an image in stark contrast to that of his music being played by an orchestra in one of Riga’s most expensive and elaborate buildings last December: the National Library. Shortly after attending a Kraftwerk concert in Riga in 2004, Lediņš passed away. Eleven years later, the work of LCCA has helped highlight just how singular Lediņš was, and how sad it is that it’s taken so long to garner the recognition it deserves.